There are many park and ride lots in the Kansas City region where you can leave your car to meet your carpool, catch a bus or meet your bike buddy. Now you can find park and ride lots, bikeshare stations and other points of interest right from your dashboard. Whether you log in first or do a quick search from the homepage, toggle the eye icon on the right hand side of the map to see the lots. 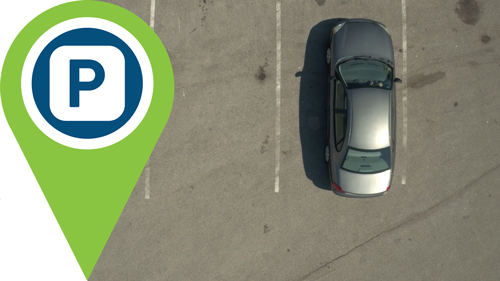 Select Park and Ride Lots to find locations where you can leave your car and hop on the bus—click an icon to view connecting transit routes and other details. Select Public Carpool Parking Lot to find locations where you can meet up with a carpool or vanpool partner. Hint: You can set a Park and Ride lot as your origin or destination for trip planning and commute partner searches. Follow any rules and hours of operation that may be posted at the lot. Roll up your windows and lock your car. And be sure anything of value is out of sight. If you see something suspicious, report it to the local police department. Don’t hide spare keys in your car and keep your car keys and house keys on separate rings. Try not to leave your car parked overnight or during a weekend.